Being a blogger is such a dream. At least it seems like it most of the time, doesn’t it? There will always be exceptional times when you find your job as a blogger extremely demanding. Personally, to me, writing comes easily. Because the basics of writing always remain the same. But finding “The Topic” to write about is what gets me stuck in my bad days. There have been times when I am with friends partying on the weekend and I take a small break and jot down a topic on a napkin. My friends laugh and say I am dramatic. I know you would understand why I do that. Exciting topics that work rarely pop up in your brain after you have spent hundreds of working hours generating original content on the web. If you are someone who has been blogging for websites for years, you know the pain. Finding unique topics that generate reader’s interactions, #shares and #likes become a headache at times. (Most times, when you are in the #blogging industry for long). But the bright side here is, the world’s a big place with lots of things. And our viewers are changing their already broad interests quite often. This generates millions of new topics every day. And then comes the rapidly growing web. My pro-tip, use the tools available online to generate new content ideas and be unique in your niche. 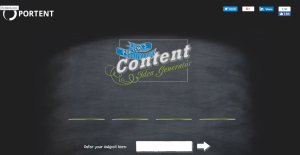 Make benefit of the available resources and focus your skills on content generation. If you are someone who doesn’t like writing about the same old topics on the web, you are at the right place. I have listed down 6 of my favorite tools that help me to generate unique content every day. It is as simple as the name suggests, like seriously! I love it because it is super user-friendly. It generates five topic ideas for you instantly. All you have to do is enter the choice of nouns you want to use in the search boxes. It has options for you to type your “Noun 1”,” Noun 2” and “Noun 3”. You can keep clicking on “Try Again” option if you aren’t satisfied with the results. 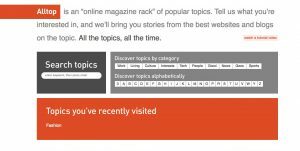 It will take you back to the homepage, and you could tweak your keywords for more topics of your choice. BUT, this isn’t the option for you if you are someone who wants too many topics popping right back at them instantly. To me, five seems like a good start. This is a favorite among a lot of successful bloggers I know. It has its reasons though. Buzzsumo doesn’t just generate topics for you; it does so much more. It tells you the number of shares a content receives, who shares it majorly, displays backlinks. Most importantly, it shows you the highly trending topics. 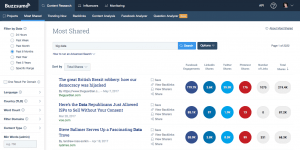 Buzzsumo gives you a very definite idea about how well your content’s performing. This information should be kept in mind while deciding what you post for your viewers. BUT, the free version will not show you all the metrics you are looking for. You should go for the Pro version if you have the budget. Last I knew it was $79, but it is worth it in the long run for your business. 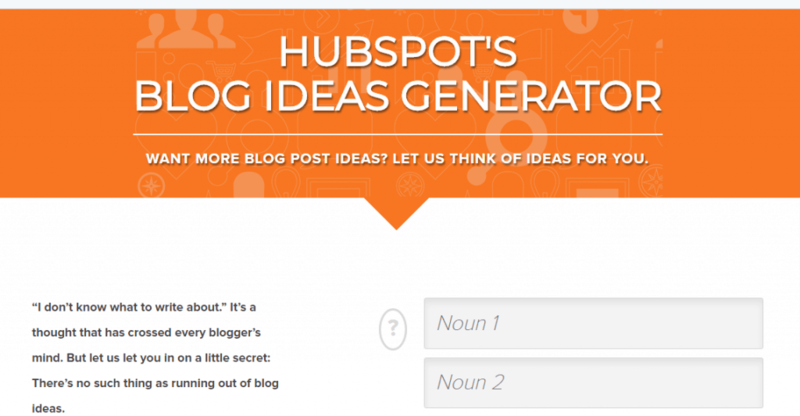 This is another excellent tool for bloggers who are looking for a full spectrum of topic ideas. It is a news aggregator which tells you about all (literally ALL) the things that are happening on the web. It covers everything from the sky religion, science, politics, and culture, etc. Topics as weird as “Why do planes crash?”. Going through their topics on the homepage will undoubtedly help you generate some ideas depending on your niche. If you are looking for a particular thing in mind, opt for the search box. BUT, it might seem a bit too overbearing with too many topics at the same time. But trust me, all the topics generated by Alltops are unique. It took me some time, but it has helped me find significant sources that I wasn’t aware of previously. This is the most straightforward tool I know. All you have to do is enter your choice of keyword, and it gives you back multiple topics instantly. (Sometimes 12, sometimes 100, depending on the keyword). It is a lot like Google Keyword Planner but is more engaging and streamlined. It has a very cool “Expand It” feature which suggests you another couple of new content ideas with the same keyword. This must not be a very new word for you. I use it to do market research and to know what topics my viewers are most interested in. Additionally, it has helped me greatly in generating new content ideas too. It apparently is not as defined as the ones mentioned above. But it solves the purpose of a content generation with a few tweaks. You can look for related topics with your keyword. You can know about the “Related Queries,” this tells you which topic people are people curious about. Most importantly, it shows you if a particular topic is trending or not. BUT, not very developed but indeed is very handy while deciding on new content ideas. It is not as strong as Buzzsumo or the others of the like, but boy it does generate blog titles like no other. It works wonderfully to churn up blog titles that will undoubtedly get all the clicks from readers. You and I both know how important the blog titles are, don’t we? I like it more because of the slight sprinkle of humor it adds to the titles. BUT, it is just the best if you can’t come up with click-worthy titles. That’s it! 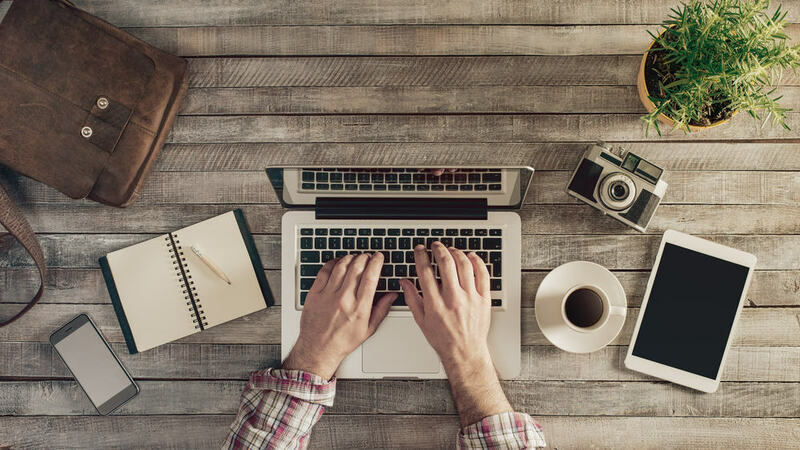 I have extensively used these tools to keep my creative juices flowing and having my loyal readers glued to my blogs. If you are serious about your blogging scene, I suggest clicking on the tools and knowing a bit for yourself. A little extra knowledge hasn’t harmed anyone. Tell me how these tools helped you or if you found any pointers that I might not know of. Published on April 13, 2018 by Bella Williams; modified on April 24, 2018. Filed under: blog, topic ideas, writing. As an academic researcher & private tutor, Bella guides the new age professionals and students with their career. A graduate of Monash University, Bella organizes free coaching workshops and promotes free sharing of knowledge. You can also find her on LinkedIn. Another useful tool is QuestionDB (questiondb.io), which gives you a list of questions asked in communities about a topic. Really helps if you get stuck.